If you have a business that deals with the public, you will undoubtedly be reviewed on Yelp!, and several other sites as well. And no matter how good your product or service, no matter how hard you try to exceed customer expectations, some of those reviews are going to be negative. Sometimes it may seem that the best course of action is to just ignore the negative comments and hope they go away. That’s like sticking your fingers in your ears while shouting, “I can’t hear you” to someone with a megaphone. Like it or not, you can’t ignore Yelp! With the combination of their mobile app, mobile and desktop websites, Yelp! claims more than 174 million unique visitors monthly. And since the site was launched in late 2004, users have posted more than 155 million reviews. So when someone pans you on Yelp!, your attitude should be that even one dissatisfied customer is one too many. Replying to a negative review accomplishes several things. It shows you care and want to make things right. It shows other potential customers that you respond to feedback and take corrective action when things don’t go as planned. Here are some tips to keep in mind when responding to an unhappy customer. Since negative reviews are inevitable, to limit potential damage it’s important to have an action plan in place from day one. Assign a team member with good communication and people skills to respond to every review, both negative and positive, but especially negative within 24 hours. 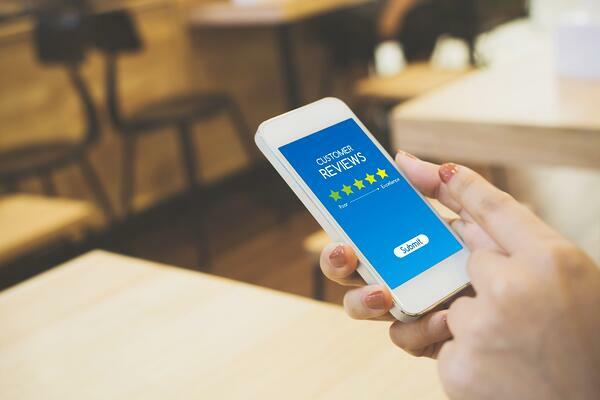 If you have so many negative reviews that you can’t get to them all within that timeframe, then your business has much bigger problems than a few unhappy customers. Remember nothing online truly ever goes away and although the complaint may have been from only one individual, every other person who looks up your business online is going to see that comment. Even minor complaints should be acknowledged, even if it’s just to thank the person for their patronage and their feedback. And you can be certain customers appreciate it when you acknowledge the nice things they say about you. People can say some pretty nasty things online, particularly when they can remain anonymous. Don’t take anything personally. If it’s possible to reply privately, make that your first attempt. Sometimes a disgruntled customer just wants to know that they’ve been heard. A private conversation, either via electronic messenger or by phone can go a long way toward appeasing the offended party. At that point you can politely request that they update the review to reflect your response. Whether your reply is public or private, always maintain a professional demeanor. Don’t take any of it personally and whatever you do, avoid responding personally, even if antagonized. The idea is to resolve the situation in a way that is good for your business. Getting into an online battle is the opposite of that. Keep whatever communication you offer, short and to the point. There are of course advantages to responding to a negative review publicly. It lets anyone who reads the reviews see that you listen to what your customers say and attempt to resolve their issues. If you do respond online avoid using the business name or relevant keywords to help keep the review from showing up in searches. Always thank the reviewer for making you aware of the issue and giving you a chance to resolve it. Stay calm. If an online comment strikes you as particularly mean or unfair, don’t lash out. A response in anger is much worse than no response at all. And getting into a “flame war” with someone who really has nothing at stake is never a good look for your business. Even if you’re in the right. Just keep these four steps in mind when responding to negative online comments, whether on Yelp!, Facebook, or any other electronic forum. Apologize, even if you think the customer is wrong. If someone had a bad experience, acknowledge how your business missed the mark and what steps you're taking to avoid the same mistake again. Offer a solution, if warranted. When dealing with negative reviews on Yelp! and other sites, about the best you can hope for finding a way to satisfy that unhappy customer so that they revise their original review to acknowledge that their complaint was dealt with satisfactorily. Remember, what goes on the internet, stays on the internet, so make sure that what current and potential customers find out about you online presents your business in the best light.